Kerr Lake is a 55,000 acre man-made reservoir lake that sits on the border of North Carolina and Virginia. It was created by daming of the Roanoke River in 1952. The lake itself includes more than 500 miles of shoreline, and the North Carolina state recreation sites cover nearly 3,400 acres. The Occoneechee (or Occaneechi) Indians once lived in the Kerr Lake area until they were dispersed by Nathanial Bacon in 1676. Until that date, the Roanoke River was the main transportation and supply route for both Native Americans and early settlers. Constant, regular flooding of the river provided rich and productive farmland that sustained the area for generations. The development of cities and homes along the river in both North Carolina and Virginia and the increased demand for flood control and electricity led to the construction of the John H. Kerr Reservoir, named after the North Carolina congressman instrumental in the reservoir's development. the U.S. Army Corps of Engineers developed the project to build the dam which sits up-river from the lake in Mecklenburg County, Virginia. In Virginia the lake is referred to as Bugg's Island Lake. Much of the land for the project was acquired from small farm tracts in the late 1940s, and construction began in 1946. Filling of the lake began in 1952 with full impoundment completed in 1953. The Kerr Reservoir Commission was created to govern the North Carolina parks bordering the lake. 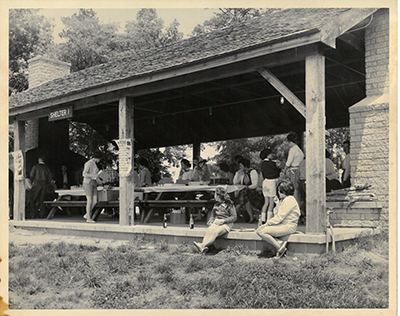 The North Carolina Division of Parks and Recreation eventually took control of the seven recreation areas of the reservoir in 1981. In addition to water resource management, the reservoir provides fish and wildlife conservation, forest management and recreation. Much of the land that makes up Kerr Lake State Recreation Area is covered by forests in various stages of regrowth that follow the farming and timbering practices of the past. The forests found at Kerr Lake are typical of those found elsewhere in the Piedmont of North Carolina. Pine stands are dominated by loblolly pines. In hardwood forest areas, various oak and hickory species, tulip poplars, sweetgums, maples, American beech and dogwoods are commonly found. In drainage areas and along the shoreline, willows, river birch and alder are found. Also found in these areas are buttonbush and rose mallow. Many types of mammals live around Kerr Lake. Mammals such as white-tailed deer, raccoons, Virginia opossums, gray foxes, red foxes, cottontail rabbits and gray squirrels are common in the woods and along the shore. Beavers, muskrats and a few river otters make their homes at Kerr Lake as well. Many of these creatures are secretive and not often seen by park visitors. There are several species of amphibians and reptiles in the area. Frogs, toads, turtles, lizards and snakes are all found here. Most snakes found at Kerr Lake State Recreation Area are harmless. Generally, snakes found in the water are non-venomous water snakes. There is one species, the copperhead, which is venomous and lives on parkland. Bird species are too numerous to list completely, but representative species are typical of the Carolina Piedmont. Songbirds include indigo buntings, red-eyed vireos, northern cardinals, prairie warblers, eastern kingbirds and Carolina chickadees. Many birds of prey also reside here. Red-tailed hawks, red-shoulder hawks, ospreys and eagles are all seen soaring overhead. Barred owls, great-horned owls and screech owls are often heard under the cover of darkness. Wading birds such as great blue herons and egrets can be found along the shoreline as they hunt for fish in the shallows. Other "fishermen" found above and on the lake include the belted kingfisher and double crested cormorant. In the winter, the common loon and pied billed grebe can also be observed at the lake. Additionally, Canada geese and mallard ducks are frequently seen on the water and along the shore. North Carolina Division of Parks and Recreation. Kerr Lake State Recreation Area. 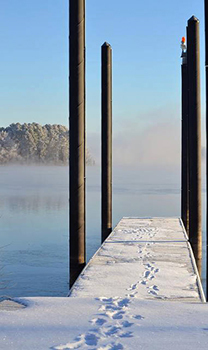 http://www.ncparks.gov/kerr-lake-state-recreation-area (accessed December 1, 2015). North Carolina Department of Environmental Quality. Natural heritage inventory of John H. Kerr Reservoir, Virginia and North Carolina final report. 1999. http://digital.ncdcr.gov/cdm/ref/collection/p249901coll22/id/658732 (accessed December 2, 2015). [Kerr Lake State Recreation Area, picnic shelter.] Photograph. ca. 1950s. North Carolina Division of Parks and Recreation. 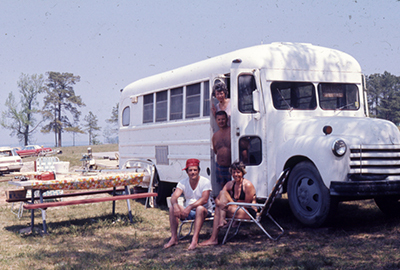 [Kerr Lake State Recreation Area, campers come to Kerr Lake in all types of vehicles.] Photograph. ca. 1970. North Carolina Division of Parks and Recreation.